Use location-based data to create a more holistic customer experience. Location Insights is a revolutionary system that will change the way a brand learns from and communicates with its customers. A one-stop application that helps the brand engage with its audience, derive meaningful insights from its customers’ feedbacks across various channels, and analyse its location-specific performance. 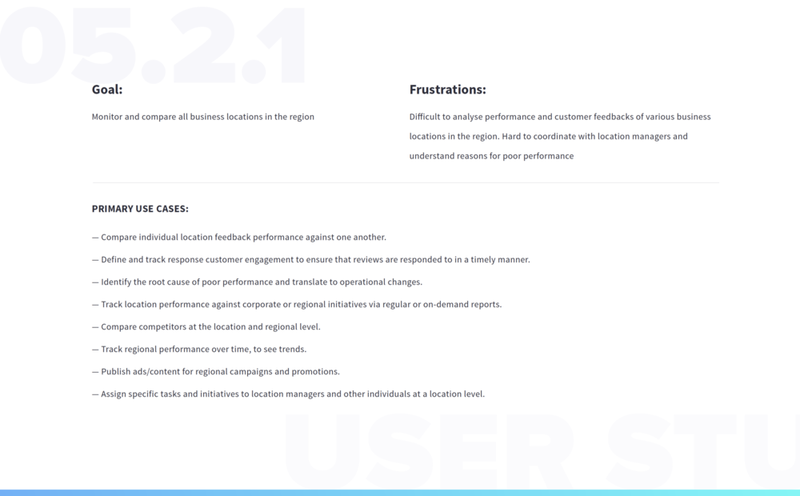 Design a deep learning system that enables brands to get location-specific analysis of their business performance and customers’ sentiments through customer insights. My Role: Led project from initial research and prototyping to the delivery of high fidelity assets. It’s difficult for big brands to track the performance of each location and understand why one location performs better than the other. After undertaking a detailed market research and communicating with the stakeholders, I gained a clear understanding of the key user group. It is divided into three categories of managers—Location Manager, Regional Manager, and Corporate Manager. To help us wrap our heads around how things work, we visited several brand locations and conducted contextual inquiry, ethnographic research, and user interviews to learn about a manager's pain points, causes of friction in their day-to-day work, current processes, and limitations. The research played a huge role in this project, and was something that we returned to at every step in the process. How might we enable brands to use location-specific data to enhance the experience of the customers? Component audit, typography, buttons, forms, inputs etc. in order to remove redundancies, condense styling where appropriate, and allow the designs to integrate smoothly. Style guide that includes: a responsive grid built in Sketch, typography + usage, new UI designs, color examples and usage. Collaborating with engineers and product managers keeps you grounded and align you with the achievable goals. And, feedbacks are a valuable gift.